It is difficult at this distance to convey the cultural and political weight that developed between 1970 and 1980 around the murders of Jeanette and Harvey Crewe and the framing of Arthur Allan Thomas for the crime. It was not only the gothic murder mystery at the heart of the matter that commanded the public's interest, but the way in which the battle to clear Thomas's name became a struggle with an establishment that cared above all about preserving its own reputation. Such were the stakes. And it wasn't easy. Auckland Star weekend deputy editor Terry Bell had to resign in order to publish his 1972 book Bitter Hill, after being told by his superiors that "it is not the role of the newspapers to attempt to try the courts". And yet it was his colleague, Pat Booth, who eventually did as much as anyone to secure justice for Thomas by tirelessly investigating the case. The role of the news media in general was crucial, in a way that perhaps would not have been possible a decade earlier. New Zealanders learned to question authority. For nearly a decade, it was a pitched battle. Thomas was tried and convicted twice, but the campaign for him steamed on. There was even a pop song about the case. Eventually, Prime Minister Robert Muldoon -- and this, along with the establishment of the Official Information Act, is one of those things that confounds the familiar assessment of Muldoon -- ordered a Royal Commission of inquiry in the circumstances of Thomas's conviction. I picked up a copy of the report several years ago, as a cultural artefact. I had not even opened it until I read Keith Hunter's new book, The Case of the Missing Bloodstain (subtitle: Inside an incompetent and corrupt police inquiry: the truth of the Crewe murders). Taken together, the two are fascinating. (a) The shellcase exhibit 350 was planted in the Crewe garden by Detective Inspector [Bruce] Hutton and Detective Segeant Johnston. (b) The shellcase of exhibit 343 was switched on two occasions, the first probably accidentally but the second deliberately. (c) The destruction of some of the exhibits in the Whitford Tip was an improper action designed to prevent any further investigation of Exhibit 350. We also find that Detective Inspector Hutton improperly misled his superiors concerning the chances of recovering the exhibits from the tip. That the officers were found to have planted a key piece of evidence -- a bullet shell casing they alleged to have been ejected from Thomas's rifle -- was enough to have Thomas freed on a Royal Pardon and compensated, on the Commission's recommendation, with a million dollars. Oddly, Thomas has never been cleared by a court, but let's just say it is unlikely in the extreme that he is the killer. We consider that the evidence as to the two stub axles and the axle beam is a morass of inconsistencies, unexplained discrepancies, and alternative possibilities … we make no findings of fact as to the axle whatsoever. Nor are we in a position to find any impropriety on on the part of the Police in relation to the stub axles or in relation to Mr Thomas's book of cheque butts. We do, find, however, that it would be quite unsafe to draw any inference connecting Mr A. A. Thomas with the axle found on Harvey Crewe's body, merely because of the two stub axles on his tip. 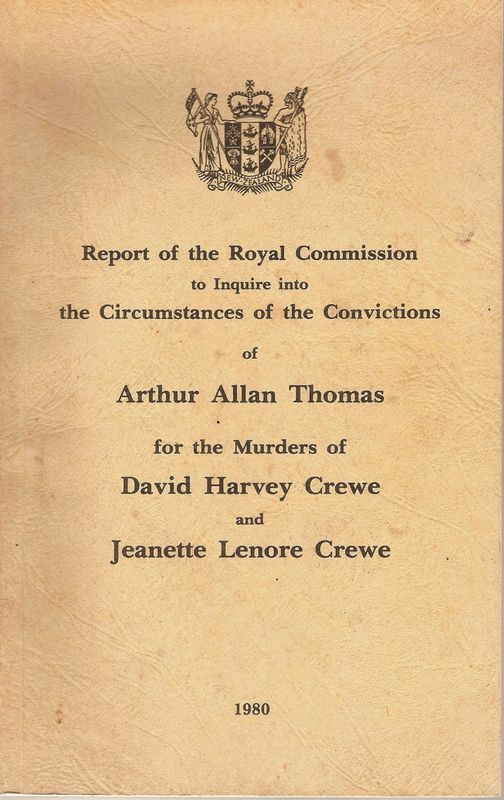 The meat of Hunter's book is the proceedings of a decade: transcripts of the police conferences (which stopped suddenly when the focus of the investigation switched to Thomas and away from Jeanette's father, Len Demler), the trials (including Justice Trevor Henry's simply outrageous summation for the jury in the first trial), the records of evidence and the hearings of the Commission, which are distinguished by the remarkable cross-examinations carried out by the Commission's chair, Australian jurist Robert Taylor. From these, Hunter draws a picture of a system (Hunter always capitalises it "System") determined to protect itself, even at the expense of an innocent man. The role of two foreigners -- Taylor and the British writer David Yallop, author of Beyond Reaonsable Doubt? -- in rousing New Zealanders from their torpor was considerable. Hunter also draws conclusions, which is where I must be careful. Johnston died in 1978, but Hutton, at the age of 84, is still alive. He has never been charged in connection with the investigation and the Weekend Herald yanked what was apparently to be a front-page story on Saturday after Hutton told a reporter he would sue if the paper referred to Hunter's key allegation against him. Hunter's book is published today, but it has not been "legalled" and he never sought to speak with Hutton, or the Thomas family. This is presumably why Arthur Thomas himself has declared he has no interest in the book -- in sharp contrast to his vocal support for a re-opening of the Crewe murder case last year, after Wishart's book was published. Media7 has also been in touch with Hutton, and although he did not specifically threaten action, he said he would consult his lawyer and consider action if the book was "a pack of lies". He also said in parting: "You just tell them I sleep well at night, put it that way." In this week's Media7, I'll be talking to Hunter, Thomas's counsel at the Royal Commission, Peter Williams QC and forensic scientist Anna Sandiford. I am sure we will find plenty to talk about -- not least Hunter's declaration, in the first line of the chapter he titles 'A Civil War', that Thomas's first trial "was the beginning of a battle which endures today." If you'd like to join us for the Media7 recording on Wednesday, we'll need you to come to the Victoria Street entrance of TVNZ between 5.15 and 5.40pm. As ever, try and drop me a line to say you're coming.